Figure: Transferrin ELISA Kit from Enzo Life Sciences, Inc.
Enzo Life Sciences, a leading manufacturer of ELISAs, continues to expand its offering with unique targets with the introduction of the Transferrin ELISA kit. Human serum transferrin, one of the members of the family of transferrin proteins, is an 80kDa glycoprotein and is a major carrier of iron in blood. It allows for the transport of the ferric iron (Fe3+) from the intestine, reticuloendothelial system and liver parenchymal cells to all cells in the body. As such, measurement of transferrin plays an important role in many disease states, specifically those involving iron metabolism such as anemia and hemochromatosis as well as liver disorders such as cirrhosis and non-alcoholic fatty liver disease. The Transferrin ELISA kit allows for the quantitative determination of transferrin in human serum and plasma as well as canine serum. The Transferrin ELISA is a highly sensitive competitive assay, measuring as little as 4.6 ng/ml of transferrin in serum and plasma, providing fully quantitative results that surpass semi-quantitative Western blot analysis. With the ability to analyze up to 40 samples in duplicate in 2 hours, this kit meets the needs for rapid, high-throughput analysis. 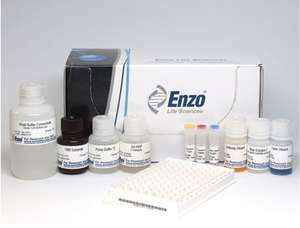 Like many other Enzo Life Sciences ELISA kits, the Transferrin ELISA is complete, flexible and thoroughly validated. Customers are supplied with a simple protocol, a pre-coated microtiter plate and liquid color-coded reagents to save time and reduce errors. The break-a-part strip plate design provides flexibility – the user does not have to run all 96-wells at once. Each kit is taken through rigorous fit-for-purpose validation and stability testing to ensure accuracy, sensitivity, and specificity. For more information or to order the Transferrin ELISA Kit or other Enzo Life Sciences products, please visit us at www.enzolifesciences.com or call us at 1-800-942-0430.